Design. A stock plan the builder has previously built will take less time than a fully custom home, even if the homeowners make some changes to that stock plan. A custom home can take months to design and a year or more to build. Some people see size as the best indicator of how long the project will take. Not so—cost is a far more accurate gauge. Imagine a pair of 2500-square-foot homes, one for $200,000 and another for $1 million. It’s a good bet that the latter will have a more complex design that will take longer to build. Permitting. The legal approvals required before construction begins have multiplied over the years. Sign-off will certainly be needed from the zoning board, the building department, the health department, the fire department and, when building in a planned community, the homeowners’ association. In some areas, design committees, historical commissions, water authorities, or other entities want their say as well. Not surprisingly, the wheels of these bureaucracies can move slowly, but an experienced builder should be able to estimate the time required to negotiate the red tape. Code requirements also have lengthened the process. For instance, in most jurisdictions, estimates of the home’s heating and cooling loads are now required before a permit is issued. Site work. Is the lot in a flat subdivision with roads and utilities already in place, or is it a sloped rural parcel where the contractor may need to cut a road to the site, then excavate and fill to accommodate the foundation? The second site obviously takes more time (and requires more permits and approvals). Weather. Northern Illinois weather can wreak havoc on a construction time line as well as the construction budget. If a home starts in November it is likely that our unpredictable weather will have an impact. Temperatures below 20 degrees, winds in excess of 20mph, and heavy precipitation can bring the schedule to an immediate halt if it occurs during the rough phase of construction. To protect the work already performed and keep construction moving along as much as possible we may have to rent a temporary heater with fuel source, and insulation blankets. Extra time is also involved in snow removal or replacement of work affected by weather. Therefore all these extra measures add to the cost of building your home rather than a home built in the spring/summer/fall months. Labor Shortage. 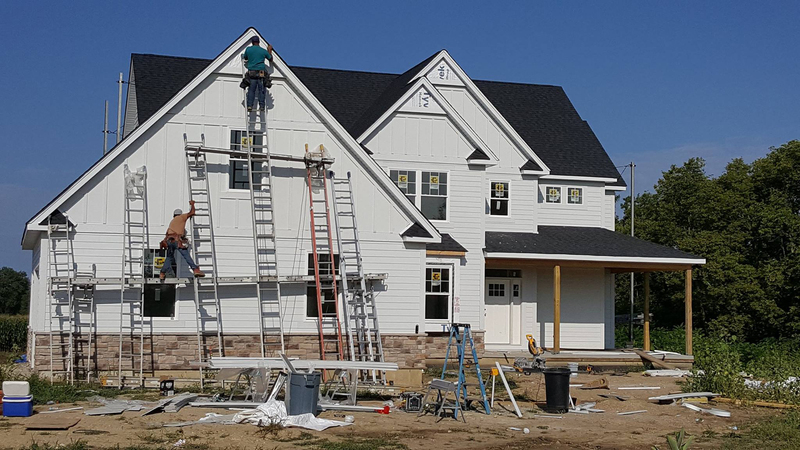 Nine years after the housing bust drove an estimated 30 percent of construction workers into new fields, the supply of skilled and unskilled labor remains tight at all levels of experience, according to the National Association of Homebuilders. In addition to this nationwide shortage of construction workers, the rebuilding efforts in the wake of Hurricane Harvey and Irma, which caused extensive flood damage to homes and businesses, is going to have a significant impact on the current labor force and unfortunately labor prices. Keeping on track. Fortunately, there are things the homeowners can do to keep the job moving. These include taking deadlines seriously, providing details on how they will live in the home, and minimizing changes. Minimize changes. Change orders are a huge time killer because they require lots of time to plan and coordinate. Changes made late in the design stage can extend design time; those made after project kickoff can extend build time. The bottom line is that, if moving in by a certain date is a priority, the homeowners need to be absolutely clear with the builder about it, and need assurance that the builder is on board. Then the homeowners and builder can plan effectively to meet the date. Thinking about building your next home? Go to www.CLDesignBuild.com to get ideas or see our process. You can also email us at CLDesignBuild@aol.com to set up a complimentary meeting to discuss your ideas and schedule for your custom home.